Mangrove palm, as indicated by the name, is a tree of mangroves. It grows in Bangladesh Cambodia, India, Indonesia (Sumatra), Malaysia, Thailand and Viet Nam. In India, it occurs in Andaman and Nicobar Islands. 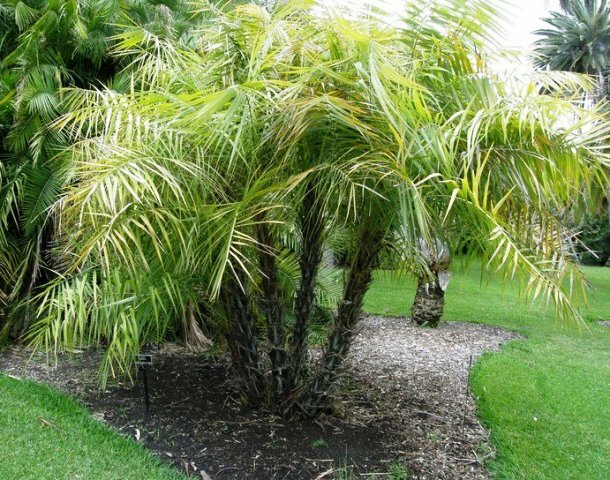 A handsome palm often with inclined and soboliferous stems upto 8 m long and 9 cm in diameter, covered fibrous network sheaths and long pointed petiole bases, the lower part is bare and annulated. Leaves spreading, 1.5 – 3 m long,; pinnae 30-60 cm long, whitish or farinose underneath. 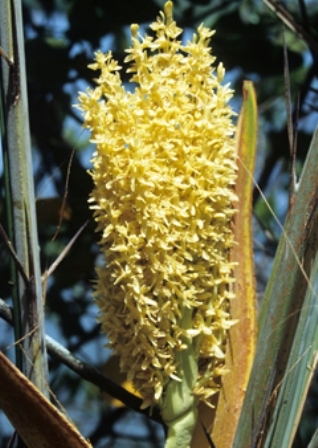 Spadices 45 cm long, with numerous spreading branches; male flowers yellow, female greenish. Fruit an oblong ovoid fleshy berry, about 1.25 cm long, shining black purple when ripe, pulp dirty greenish black, occurring in clusters. 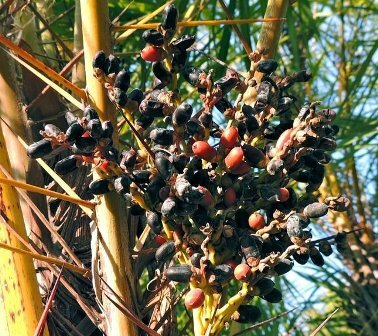 Ripe fruits of mangrove palm are sweet and edible. These are also reported to possess cooling and antiphlogistic properties. The pith of the stem is also edible. The leaves are used for thatching and for making rough ropes, fences etc. Larger stems are used as rafters. The fruits have been used as a coffee substitute. Mangrove palm occurs in wild only. It has not been brought under cultivation yet.